All presentations are a minimum of 1 hour in length unless otherwise stated and can be customized to better accommodate your group. Programs include a PowerPoint presentation with handouts for participants that can be presented in person or via a webinar. Enjoyed one of my articles or blog posts? Many of those can also be adapted for a presentation. For more information, please contact Gena at 909-556-9003 or at genaortega@gmail.com. “He was just a farmer” is a common lament but what about the farmer’s wife? Sources and material culture can help reconstruct her life. Learn about virtually unknown sources and repositories including the USDA Library, farm newspapers, and more. The 19th amendment was passed in 1919 and ratified in 1920, ending a long struggle for women’s voting rights, but some women were already voting and leaving a record trail. When did your female ancestor first vote? What records survive? And what can we learn about her based on extant records? 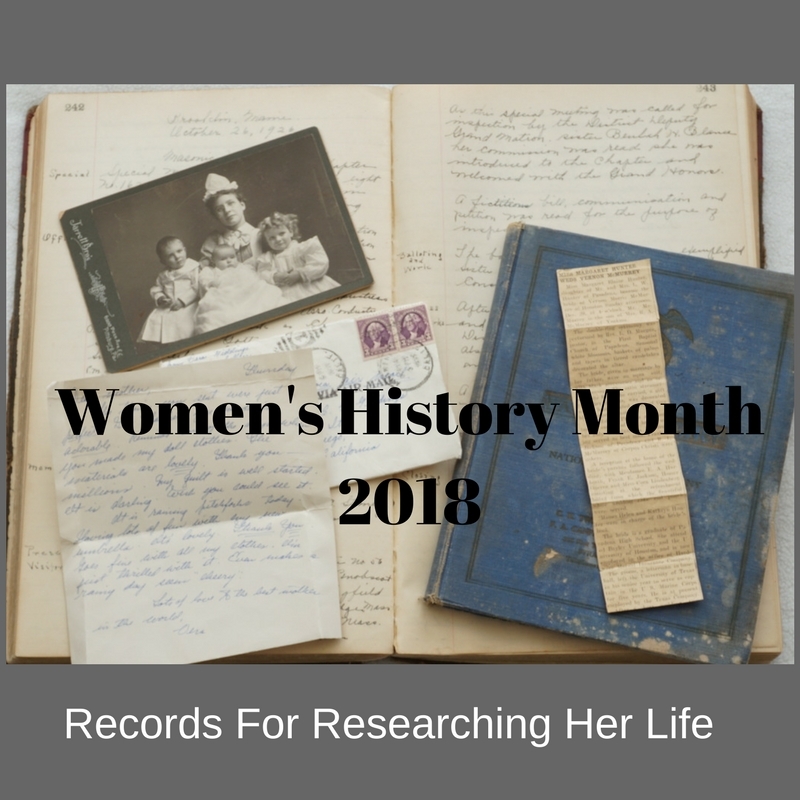 Every year for Women’s History Month, I create 30 blog posts about researching female ancestors. Based on those articles, learn 25 tips that will help you identify, trace, and discover more about your female ancestors. “What’s her maiden name??? ?” is the question I get asked the most. Knowing where to find it is half the battle. In this presentation we will look at 20 documents that provide a woman’s maiden name and discuss strategies for uncovering it. Not too long ago, American women lost their citizenship when marrying non-citizens. While the 1920s saw changes to this law, women were still applying for their citizenship well into the 1970s. We’ll discuss marriage and women’s citizenship, as well as their repatriation. Examples from research at the National Archives and other repositories will help tell the story of these women’s lives. Why is finding a female ancestor so difficult? One reason is the way we research their lives. Successful research must combine familiar genealogical sources and the specific sources that women left behind. It is the sources that women authored or participated in that tell us their unique story. In this lecture we look at the specific trail women left including signature quilts, community cookbooks, journals, and diaries. 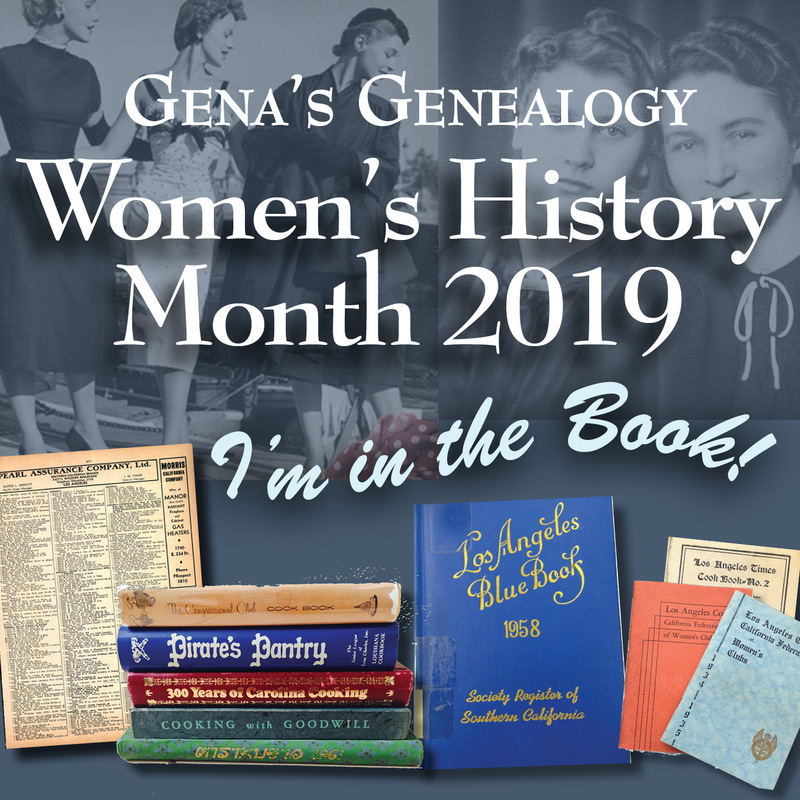 City directories are great, but what other types of directories exist that can lead you to information about female ancestors? Surprisingly there are numerous kinds that include members of a church, community group, and membership organizations. Learn more about directories, what they contain and most importantly, where to find them. Imagine finding a 1930s quilt top with the names of numerous women and, through genealogical research, uncovering a community. After I purchased a quilt top in Southern California, I started a research journey that led me to Indiana and a unique community of women and the records they left behind. Newspapers are the great equalizer and women are prominent in their pages. In this lecture we will discuss the types of articles women can be found in, as well as search-engine tips specific to researching women. The lives of Mormon women are documented in various archives, libraries, and museums. In this presentation learn ways to find out more about your Mormon ancestress beyond the information about her in familiar sources like the census or vital records. Was your ancestor a victim of a tragedy? Sinking ships like the Lusitania or Titanic, geological events like the 1907 San Francisco Earthquake, and weather events like the Children’s Blizzard can mean destruction and death. Did those events touch your family? Where are the records to help tell that story? Using case studies, we will explore the events and the records they left behind. How do you research your ancestor in the newspaper? Coming up empty handed? Do you know there’s more out there, but you just can’t find it? Learn the five steps to better newspaper research that will enhance your searches and help you find what you need. Writing a weekly article for a digitized newspaper website provides me the opportunity for finding all sorts of interesting articles, advertisements, and classifieds that are missed by most researchers. In this presentation I’ll share some of these unique finds and how they relate to genealogy. I’ll also provide some best practices for searching digitized newspaper websites. We face brick walls in our research for a variety of reasons. In this presentation we’ll explore 10 of those reasons and how you can overcome them. Family historians today have technology tools that help make researching easier than ever. From online digitized images to DNA, genealogy is becoming a pursuit that many more are engaged in because of the increased access to these tools. But what about that brick wall? Having more technology and digitized records doesn’t mean you’ll find what you need. Sometimes we need to go back to the research basics. Knowing good research methodology, where to find information, and how to use old-school genealogy tools like Soundex can help. In this presentation we take a step back in time and learn, or re-learn, those genealogy methodologies that can make a difference in your research. Are you a frequent library patron? What types of libraries have you visited? Do you know what to look for at a library in the hometown of your ancestor? Whether you have a wallet full of library cards or you haven’t been in a few year, this presentation will provide you the tips you need to do better research. In this presentation we will look at types of libraries, what they hold in their collections, and tips for getting the most out of your library trip. You want to research your great-grandma? Great! Now what? After you spend some time looking online and have hit the brick wall, what are you supposed to do? Tackling a research project is so much more than entering names into a database. Learn more about planning, creating, and researching so that your time online and off will be successful. Periodicals can fill in the pieces between the birth and death of your ancestor. Whether the information is biographical, a transcription, or reporting on an event, periodicals provide rich detail about your ancestor’s life. In this lecture we will discuss the types of periodicals that exist and what indexes (JSTOR, PERSI, and others) to use to find articles. I have them and you have them. In fact, we all have them ̶̶̶ that story about our family’s brush with greatness. Maybe you’re related to Jesse James, or your ancestor was on the Titanic, or you’re descended from three brothers who came to America. But is it true? Learn the methodology for proving or disproving that family story. Manuscript collections include documents detailing the lives of individuals, groups, and communities. Manuscript collections are a rich source for research that is basically ignored by many conducting family history research. In this lecture we will discuss which manuscript collections exist, how to find them, and what they hold for your research. Books You Need to Be Using TODAY! What books are must-haves for finding your ancestor? What about learning more about researching a record set? Do you know which books have information about your Mayflower ancestor or your family member who was a silversmith? In this presentation we will go over must-have books for research and how to locate them. What’s ephemera? It’s the stuff that much of our genealogy research is built on. Defined as paper items that were not meant for long-term archiving, ephemera can hold great genealogical value. In this presentation I will show you examples of genealogy-rich ephemera and how and where you can find it. Learn more about your ancestor’s life by using social history. In this presentation we will talk about websites that provide us the detail about our ancestors’ lives and resources for further research. My ancestor ate what?! What our ancestors ate was very different from the food that we eat today. Learn more about how food history interacts with your family history, including food availability, food during war time, and what our immigrant ancestor ate. Sure, you know that the census, city directories, and the World War I Draft registration are on Ancestry.com, but what about those little-known databases that include images, digitized books, and indexes? There are hidden treasures in Ancestry for those who know how to find them. We will explore searching on Ancestry to uncover the lesser known databases, and we’ll look at 10 specific ones for your research. It’s the most important genealogy tool you should be using, but do you know all the features of the FamilySearch Catalog? Learn more about ways to search, search terms, and other catalogs that help you find Family History Library materials outside of Salt Lake City. We are so lucky to be living in today's world where we have access to so many digitized books online. In this presentation, learn about what types of books exist online, how to access them, and how you can search for them. Websites discussed will include Google Books, Hathi Trust, and Internet Archive. You’re familiar with Ancestry.com and FamilySearch, but there's so much more to researching genealogy then the well-known websites. Learn more about other websites that can help you with your genealogy and help you break down brick walls. Where do you find vital records? That simple question doesn't always have an easy answer. In this presentation, we will explore online finding aids, indexes, vital record alternatives, and digitized copies of vital records. This information is a must for anyone researching US ancestors. It's hard to keep up with all the different websites that can help you with your family history, but there are a few core ones that are crucial to your research. In this presentation we will explore such websites as WorldCat, ArchiveGrid, and the Digital Public Library of America. Want something that’s not the same old presentation/lecture? Not sure about hosting a workshop, but you know you want an interactive presentation. Check out these programs that combine lecture with an experience that includes working with original records, cookbooks, food, and more. Experiences are best if there is at least a 1 ½ hour to 2 hour block of time. Using life in the 1920s as a case study, we will look at sources for learning more about the era and the people living during this time. We will explore fashion, home management, occupations, membership organizations, news, historical events, entertainment, and more. We will then discuss how to conduct social history research in any era. Presentation includes food, music, and ephemera. Community cookbooks, commonly known as fundraising cookbooks with the plastic comb binding, have been around since the Civil War. They serve as a “city directory” of women, with everything from names, residences, and in some cases familial relationships and photos. Learn more about community cookbooks and using them for your family history. Presentation includes community cookbooks and food. We begin part one of this workshop with some tips for solving brick wall problems. Types of brick walls we will cover include pre-1850 ancestors and common surnames, and same-name individuals. We will also go over resources every researcher should know. In the second part of our workshop, we will look at participants’ brick walls and suggest a research plan to help go from being stuck to solved.